Noxious weeds are moving into our local ecosystems and displacing native plants as our community grows and develops. When the plants used by animals as food, shelter or nesting are gone wildlife could leave the area. Additionally, some weed species drop over 1,000 seeds into the ground annually, if not controlled. As good stewards of our land – with a single-family lot or a thousand-acre ranch – we all must work to keep our lands free of noxious weeds. Noxious weeds can be managed by using a combination of control methods including mechanical, cultural, biological, preventative and chemical means. Biological Control: releasing beneficial insects which feed only on certain noxious weeds and well managed grazing practices that target specific plants. Above all, proper noxious weed identification, monitoring and consistent, diverse control methods can reduce or eradicate infestations. This varied approach to weed management is called integrated pest management, or IPM. We support the IPM approach to weed control within our borders. 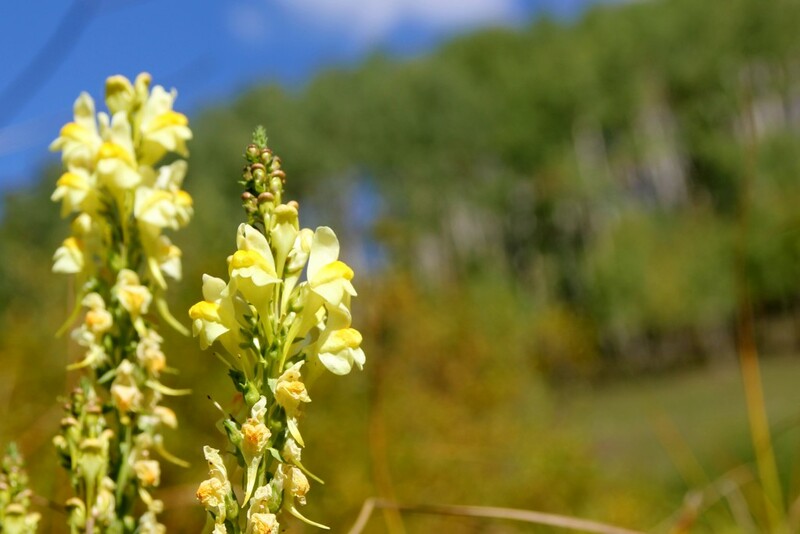 The Colorado Noxious Weed Act also directs municipalities in the state to adopt a weed management plan and weed advisory committee. We adopted our first weed management plan in 2012. We also work in partnership with San Miguel County controlling weeds along our roadways and right-of-ways. We have the duty and power to manage noxious weeds in the community. Our Public Works Department oversees local weed control efforts and advises Town Council on local weed control matters. This includes the right to enter private lands to inspect for the existence of noxious weed infestation. When noxious weeds are found on private property, the landowner or property occupant will be notified. After notification, the landowner or occupant of the property has 10 days to comply with the terms of the notification or submit a plan and schedule to destroy, remove and control the weeds. For more information regarding weed management in Mountain Village, contact the plaza services manager. What Do These Weeds Look Like? To help identify these weeds and simplify the differences between invasive weeds and native plants, including the look-a-likes, handy guides are available at Town Hall. You can also refer to the short descriptions and images on this page. Yellow toadflax is a pretty, yellow-flowering perennial resembling snapdragons, and it reproduces by both roots and seeds, so once it invades it can quickly dominate and become hard to control. Persistent hand pulling or digging can effectively eliminate this plant when found in small patches. Just be sure to remove as much of the root system as possible and pull the plant prior to it going to seed. 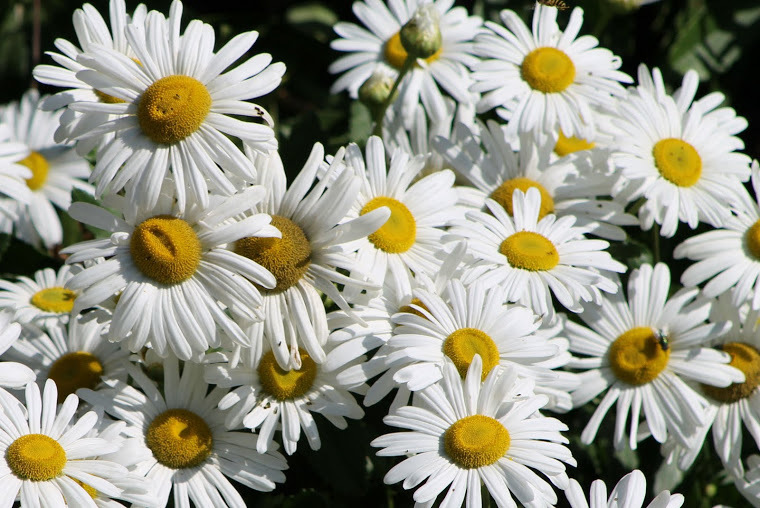 Oxeye daisy, a member of the sunflower family, is tempting to plant in your garden because it establishes quickly. But this plant is so invasive that it has been declared illegal in seed mixes and gardens in San Miguel County: one plant produces thousands of seeds in a season making this one of the most prolific weeds in town. The key to neutralizing oxeye daisy is finding and removing it early. Hand pulling and digging helps, but be sure to pull up all the roots and bag after removing so the tiny seeds aren’t scattered inadvertently. 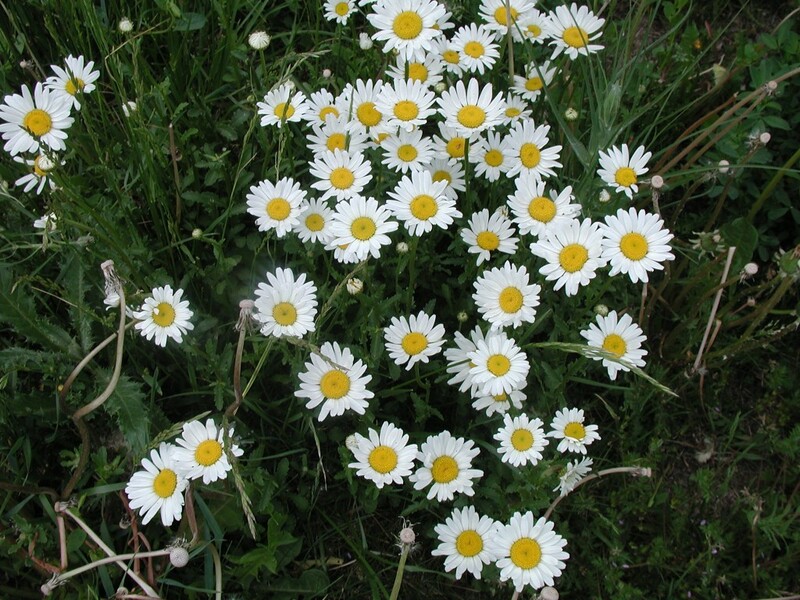 Another important fact to note: oxeye daisies are frequently confused with their fairer, non-invasive cousin the Shasta daisy. 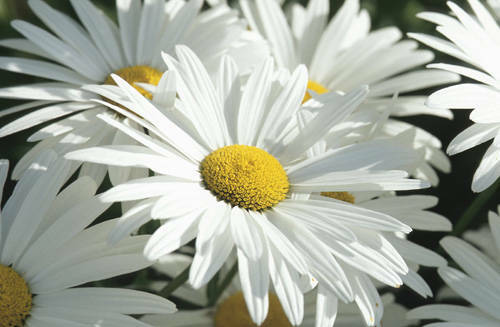 Shasta daisies are typically taller, have broader smoother-edged leaves and larger flowers. So make sure you are pulling the correct plant and that your landscaping or seed mix is the right type. 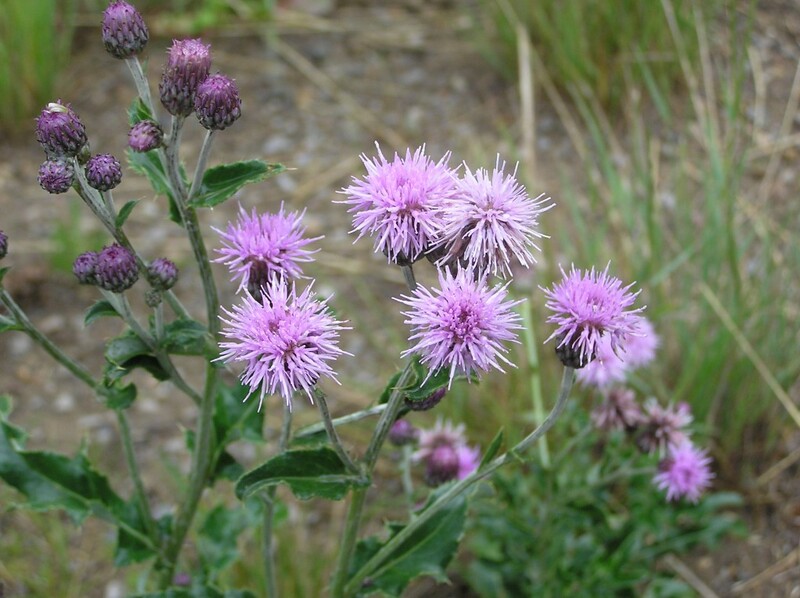 Canada thistle is one weed that you won’t miss on your property with its large saw-toothed leaves and spiny purple flowers. And this creeping perennial is prolific, producing up to 1,500 seeds per shoot. The blow-away thistle seeds can be transported long distances by water, clothing, vehicles and by attaching to animal fur. The seeds remain viable for up to 22 years! Seed dispersal and germination are not the only way thistle spreads: new shoots and roots can form anywhere along its root system. Mowing and weed-whacking are effective tools when performed continuously throughout the growing season, and so is clipping and bagging the seed heads (to prevent seeds from blowing onto your neighbors property). If you are pulling thistle, be sure to remove the entire root and wear thick gardening gloves as the leaves are exceptionally prickly. 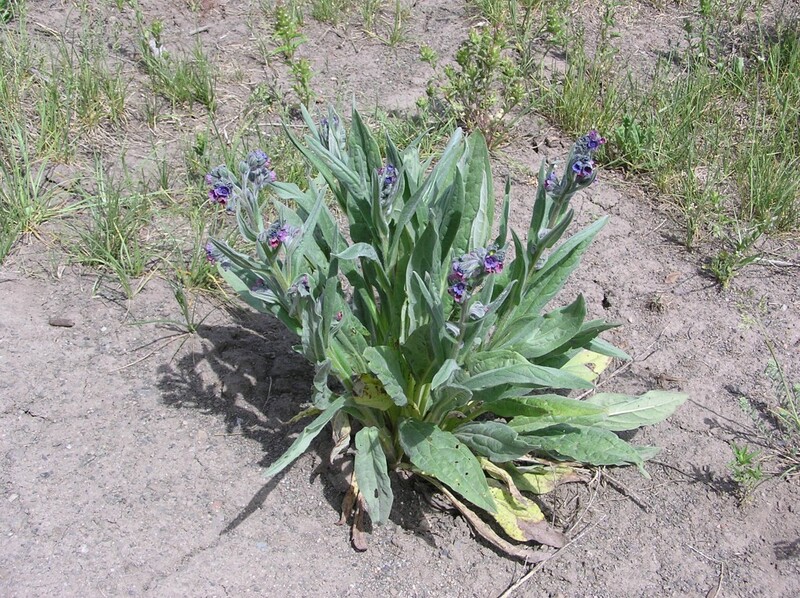 Houndstongue is a small biennial weed that grows close to the ground and produces reddish-purple flowers and has sharply pointed leaves covered with fuzzy, soft white hairs. Houndstongue reproduces by Velcro-like seeds that are easily transported by animals, clothing and machinery. A mature plant can produce 2,000 seeds that are then dispersed by their new hosts to distances far and near. The key to effective control of Houndstongue is preventing the plant’s establishment and seed production. Houndstongue has crept onto many properties along Adams Ranch Road, likely from migrating elk and deer.